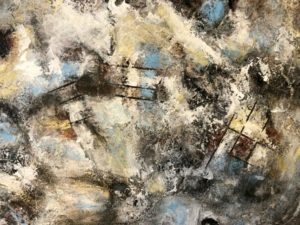 The Brandon Artists Guild is proud to present “Head in the Clouds”, the first solo show of works by abstract painter Dave Fifield. The exhibit will be up from May 4 – June 26, 2018. The public is invited to the opening reception Friday, May 4 from 5-7pm. Dave is a native Vermonter and a graduate of the University of Vermont, where he studied audio art and philosophy. He became interested in abstract art almost as soon as he started taking courses. This exhibit is part of Vermont Arts 2018 – a year-long celebration highlighting arts events across the state, sponsored by the Vermont Arts Council. The Brandon Artists Guild is an artist-run organization comprised of 30+ exhibiting artists plus additional supporting members. 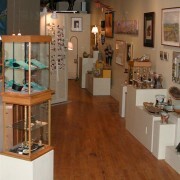 A 501(c)3 nonprofit cultural organization, the BAG supports the arts in Vermont through exhibitions, lectures, demonstrations and educational programs.